The deals just keep getting better! 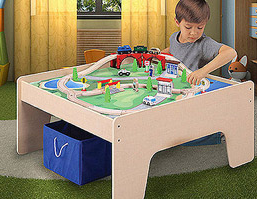 Right now, Walmart has this Wooden Activity Table with 45-Piece Train Set and Storage Bin. This is a GREAT PRICE! Don't forget that it will SHIP for FREE with a $50 purchase or it ships for FREE to your local Walmart store.